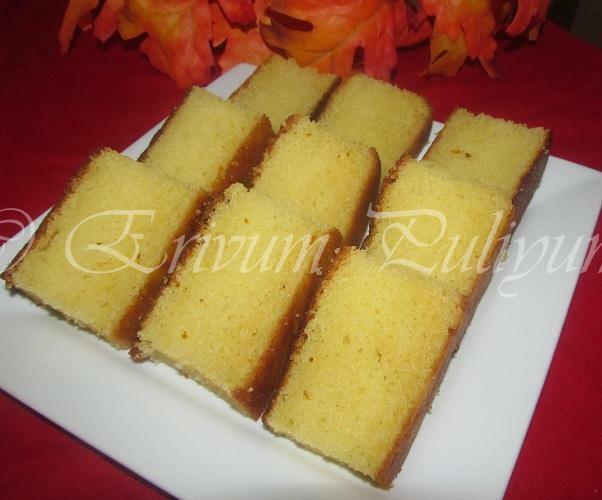 Erivum Puliyum: Butter Cake (Old Fashioned)~Yummilicious !!!! Butter cake,as the name is the texture of the cake;utterly buttery & delicious.Perfect to celebrate any occasion and once in a while as the cake is rich in calories.This cake was posted by many of my blogger friends and one of my family favorite cakes as well.I always had the store brought version of this cake and so I bookmarked this recipe from here and it came out very well as you can seen in pics.And am happy too as I could strike out atleast one from my to do list.She had used half the quantity and baked in a 8*4 loaf pan;however I used a 8*8 square pan to bake the cake.Hope you will all enjoy baking this cake at home and each one of you would love each & every bite of it !! -Sift the flour,baking powder and salt atleast 2-3 times.Keep aside. -Preheat oven to 350 degrees F / 180 degrees C.Grease a 8*8 square pan and lining the bottom with parchment paper,keep aside. -In a large bowl,beat the butter and sugar until pale and light.Add in one yolk at a time and beat well. -Beat the egg whites together in another bowl until fluffy. -Incorporate it with the butter-sugar mix,Add in the vanilla essence.Mix to combine. -Add the flour in 2-3 parts alternating with milk.Mix well with a spatula. -Remove from pan and cool on wire rack,Cut into pieces and serve with tea !! * If you are using a cake pan of 8*4 size bake for 30-35 minutes only.My cake got done at 42 minutes but please be sure to check with tooth pick whether its done or not. * I used the regular granulated sugar and powdered it.The powdered amount should be 1 1/2 cups.Its a moderately sweet cake. 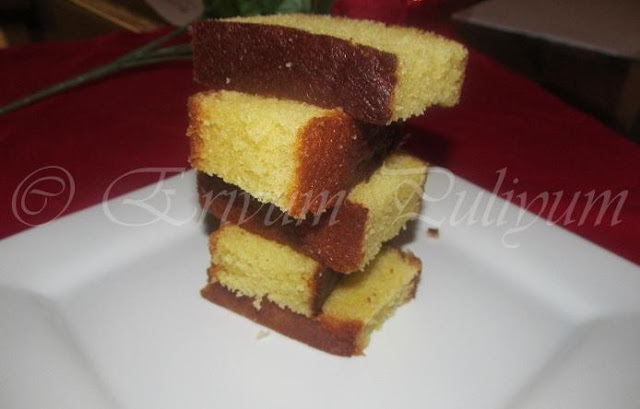 Perfectly made butter cake,looks so spongy and soft,feel like grabbing it...well done Julie. wow julie. Cake is perfectly done and baked... Bookmarked this recipe. This butter cake looks delicious and perfect. I wish to have a slice. Julie! 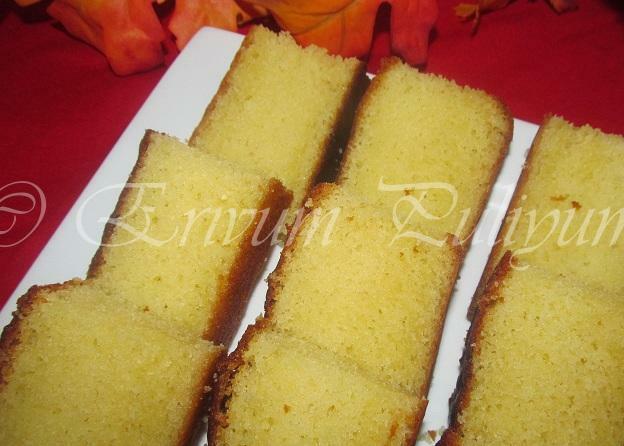 butter cake old fashion is the best... loving it!!! my fav. 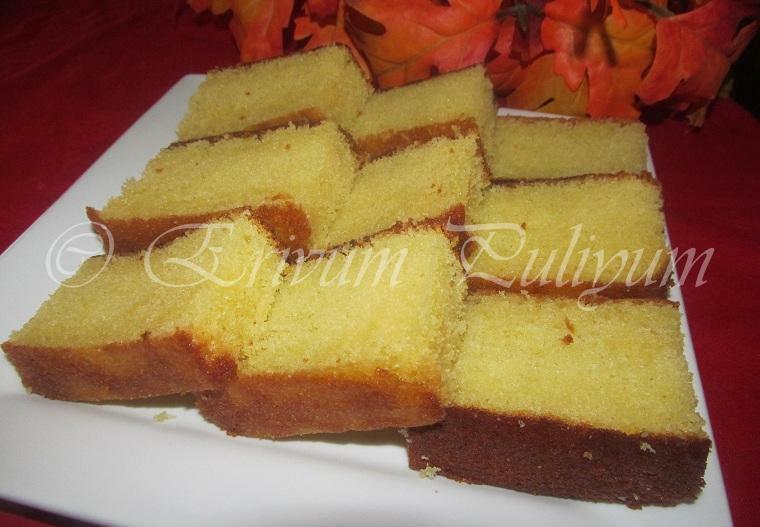 cake.. love to try it..
Omg, seriously am drooling rite now here, wat a super spongy super buttery cake. wish I could grab a slice of it. 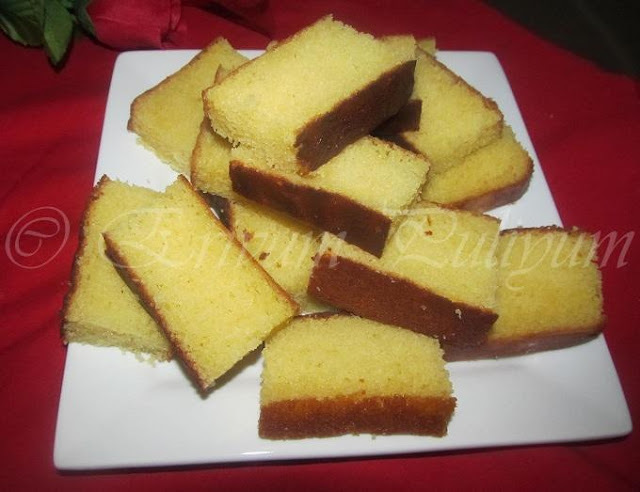 This looks soo buttery and yummy Julie.. i want to stretch my hand and grab a bite..
you make dishes that remind me of my childhood.. we used to get these from our local bakery... simple, but perfect.. i also remember the plum cake slices that you had made.. This cake is my favourite mom use dto make always and also she used to buy it from the bakkery too. Yours looks really yumm. a perfectly made cake dear !!! !I always make this cake at home as both my daughter n hubby loves this one than any other flavors !!!! ohh yes...almost forgot !! !love the new look of your space !! !y don't u move to your own domain now ???? Just yummy and awesome and love it .Bookmarked. in our enthu to make different we forget the simple. Thanks. They look amazingly moist and soft. Would love to have one from that plate. looks delicious ........kandittu kazhikkan thonnunnu!!!!!!!!!! No words dear.. cake looks just Awesome.. Beautiful clicks..Looks like a Wonder Cake..You know that right?It same like pound cake!! When i get a microwave or oven, the first thing I'm gonna bake is your simple & traditional cake. The stacked up picture of cakes just makes me want to pounce over the cake & empty it. Yep cake with coffee/tea is a great combination. In Kannada they call it "Sakath combination maghaa" ;-). I don't speak Kannada, but the sounding of those 3 words are easy on ears. Tried your recipe few days back. So fluffy, tasty. Thanks for posting the recipe. I got so many compliments in the first trial itself. But the recipe needs 2 butter sticks, may be next time will reduce that.